Is the welfare state about need or nudging? Concerns about immigration and support for welfare reform are growing, a study of British social attitudes suggests. The data from NatCen Social Research – based on the views of some 3,300 people – also shows a widespread anxiety about the prospect of further spending cuts. But for the first time in nearly a decade, there was a rise in the number of those who think spending and taxes should be increased, the report says. It comes after news the UK economy shrank by less than thought up to June. The latest revised data from the Office for National Statistics found the economy contracted by 0.5% during the quarter between April and June – less than the 0.7% it announced in July. 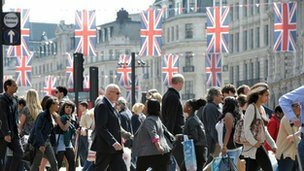 The British Social Attitudes survey asks more than 3,000 people every year what it is like to live in Britain and how they think Britain is run. Despite the tough economic climate, the study by independent social research agency NatCen reveals attitudes towards welfare and welfare claimants have toughened. Only 28% of those asked wanted to see more spending on welfare – down from 35% at the beginning of the recession in 2008, and from 58% in 1991. Report author and NatCen chief executive, Penny Young, said the study showed the public’s view on welfare was “in tune… with the coalition’s policies”. She said: “The recession doesn’t seem to be changing things; attitudes continue to harden. And on immigration, the report suggests British people “strongly favour migrants they see to be socially beneficial”, according to the report. Some 51% would like to see immigration levels “reduce a lot”, a figure which has risen from 39% in 1995. The data also shows a further 24% would like to see levels “reduce a little”. Meanwhile, the proportion of people who want to see further public spending – even if this requires higher taxes – jumped from 31% to 36% between 2010 and 2011, after falling for nearly a decade from 63% in 2002. More than half – 55% – would like spending levels to stay where they are. At the same time, the report reveals many Britons are worried about the impact of spending cuts on public services, particularly education and health. Satisfaction with the NHS fell from 70% in 2010 to 58% in 2011, according to the figures. I can’t say that this so called “hardening” of social attitudes surprises me. The last 10 years has seen what Marx would have described as the proletariat, i.e. those who need to sell their labour for an income rather than live off of their land or capital, have seen a massive squeeze on their standard of living. The causes of this are already well known: stagnant wage growth, high housing cots, significant inflation on staples such as food, transport and utilities and increased taxation. Those same people look around and they see those both above and below not experiencing similar levels of relative decline; both the wealthy and those not working have avoided relative decline. There has been much made of the proposed changes to housing benefit legislation, which caps the maximum level of benefit that can be received. The claim is that “the poor” will be forced out of affluent areas of London, but most ordinary working people, who are neither in receipt of six-figure salaries nor state benefits have been priced out of these areas for many years already. Such a situation is unsustainable; an enclave of the wealthy at least has greater logic than one where only the very rich and very poor can inhabit. Societies that flourish have always been those where the “mass middle” feels happy and that their standard of living is gradually improving; the “American Dream” of the 1950s and 1960s. If governments around the developed world cannot star addressing this, then the historical conditions for the rise of demagogues will be place. There does need to be a reduced slice of the economic pie for the wealthy, the “1%” of many a protest slogan, but there also needs an elimination of the “something for nothing” benefit culture. There will be shrieks for both sides of the political aisle, but it is a necessary and inevitable, one way of the other. Even Marx would agree, being equally unsympathetic to both the idol rich and idol poor.